Trees could be redundant as far as carbon debts are concerned. Together with his artificial tree, Professor Klaus Lackner has been working on carbon absorption for many years. After trying artificial carbonates and storing liquid CO2, he has brought his latest ideas to the Institution of Mechanical Engineers' Air Capture Week in London. 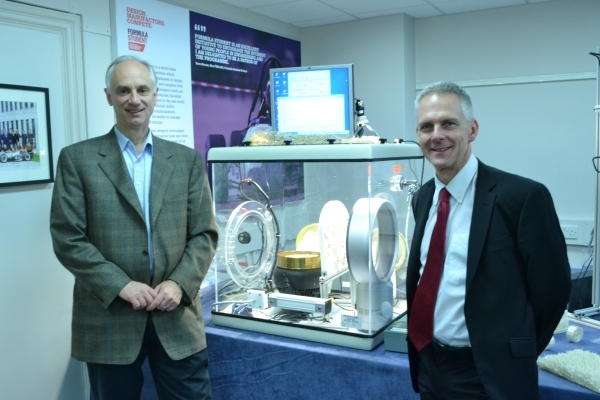 Dr Tim Fox, Head of Environment at the Institution of Mechanical Engineers said, "As this device shows, this breakthrough technology works. What we need from Government and industry isn't vast amounts of funding, but strategic direction of where this technology could fit in to the strategy for dealing with climate change. Apart from being a vital technology for dealing with difficult to manage emissions like those from aviation and shipping, this technology could also be a vital tool for setting a definitive price for CO2." 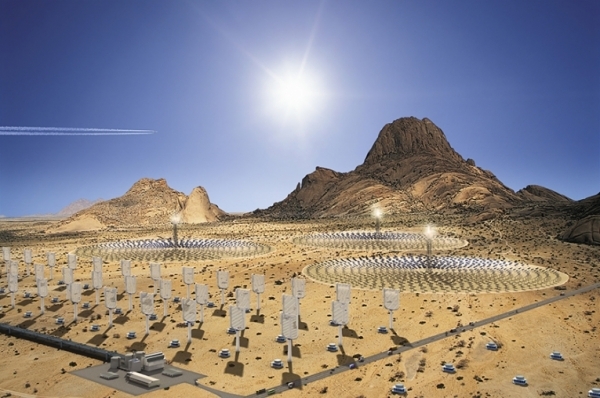 The two images (above and top) are an artist's impression of a renewable energy assembly, used to power carbon dioxide absorption. Especially interesting is the lack of cost and the small-scale potential of the current device. An artificial tree uses chemical "scrubbing" of the air to extract the gas, although details are secret because of copyrights. This means that the energy requirements for the filtering are debateable, but Lacknerstates that the cost per tonne of CO2 removed from the atmosphere by early prototype machines would be about US$200/tCO2, based on capital costs of individual air capture units at about US$200,000 and anticipated US energy prices for operation. Such machines would capture 1tCO2/day. However he has suggested that, through learning effects, mass production and improvements in operation, the performance could be improved to the range 1-3tCO2/day and the capital cost reduced to about US$20,000 per unit. Transport and sequestration of carbon dioxide involve several costs in addition to the basic infrastructure. Pipeline and other transport is low cost, unless the distance involved is great. Perhaps $10 maximum per ton of CO2 would be a good estimate. The storage of the gas, at $1-2 per ton includes injection, measurement, monitoring and verification procedures. A really valid piece of further research is how to deal with the stored CO2 and how to use it. Making synthetic fuels such as methanol from hydrogen is the simplest. Energy sources for the energy-intensive process must be continuous to maintain the process, rather like the air capture machine. The only real difficulty for overseers would be preventing the use of "new" CO2 emissions rather than recycled gas. The future isn't bleak, it's simply not using real trees to absorb our carbon debt.